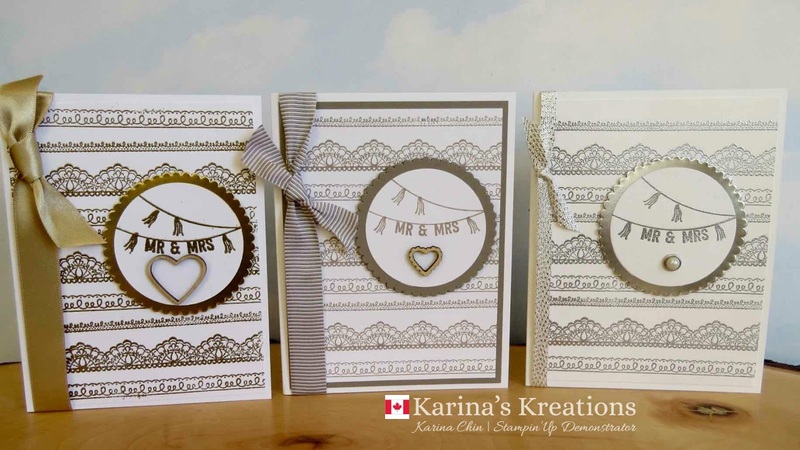 Karina's Kreations: Thailand Achiever's March Blog Hop Last Call for Sale-a-bration! Thailand Achiever's March Blog Hop Last Call for Sale-a-bration! Thank you for joining us in the Thailand Achiever's March Blog Hop. Sale-a-bration is almost over so the theme this month is last chance for Sale-a-bration! 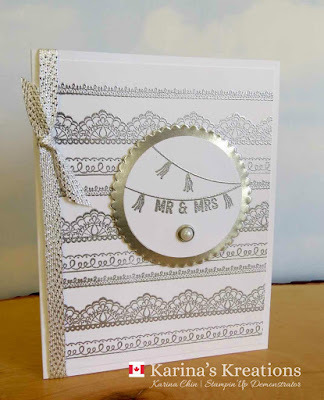 I used the Delicate Details stamp set #143314 and the Any Occasion stamp set #143348 on my card. Both of these sets are FREE with a $60.00 order. 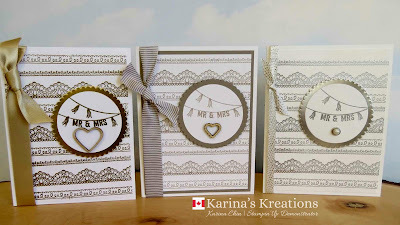 Wedding season is coming up so I made three different versions of this card. 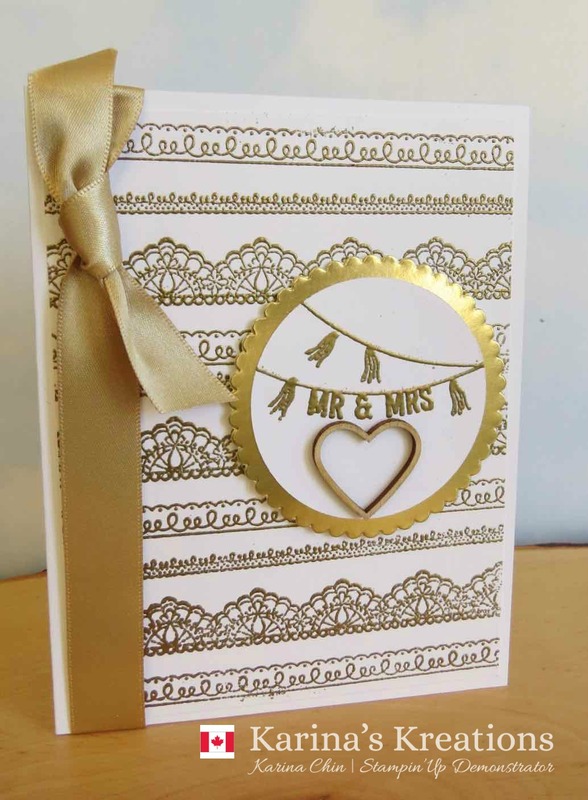 This card was stamped with Versamark ink and embossed with Gold Embossing Powder #109129. I also used Gold Foil sheet #132622, Gold Satin Ribbon #134547, Layering Circle Framelits #141705 and Sending Love Embellishments #142735. 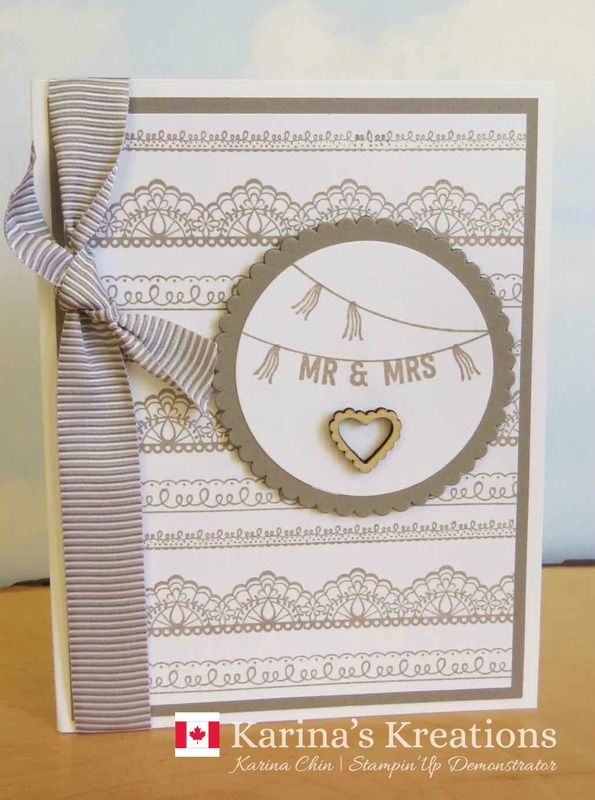 This card was stamped with Versamark ink and embossed with Silver Embossing Powder #109131. I also used Silver Foil sheet #132178, 3/8" Metallic Sale-a-bration ribbon #143601, Layering Circle Framelits #141705 and Metal Rimmed Pearls #1138394. This card was stamped with Tip Top Taupe ink #138835 and uses Whisper White #100730 and Tip Top Taupe card stock #138336. The ribbon is 5/8" Mini Striped Tip Top Taupe #141432. 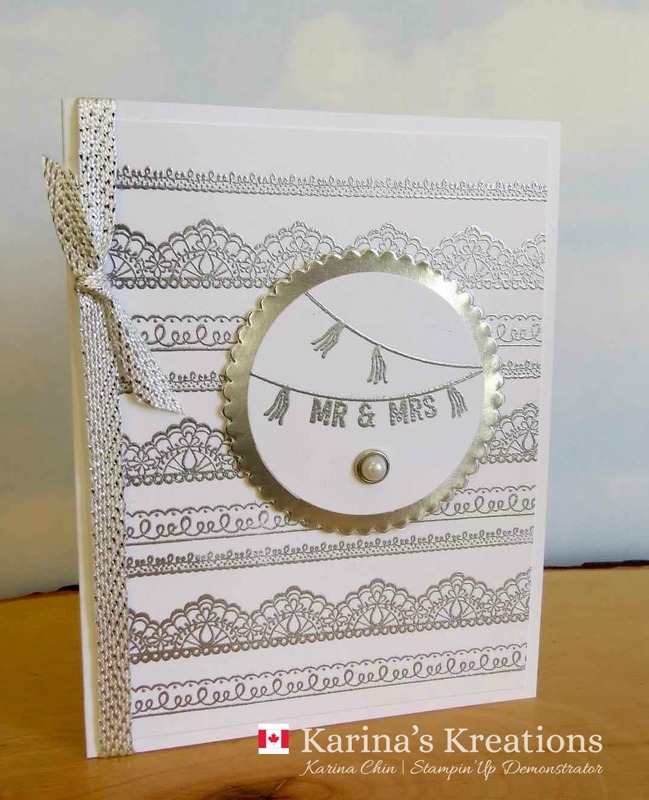 I also used the Layering Circle Framelits #141705 and Sending Love Embellishments #142735. Tip Top Taupe, Watermelon Wonder, Cucumber Crush, Mint Macaron and Delightful Dijon are retiring In-colors. I would recommend stocking up on ink refills, paper and ribbon and getting a sale-a-bration item for FREE. I'm a Canadian demonstrator and would love to help you. Click this link to see my online Stampin' Rewards program! Thanks for looking at my blog and make sure to check out all the other amazing projects in this blog hop. 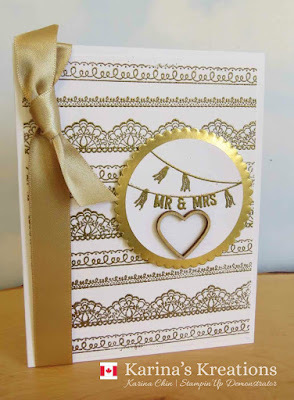 Elegant wedding card! thanks so much for sharing! OH MAN! I love these projects!!!! Such an awesome use of lots of SAB items! Thank you so much for sharing this amazing creation!!!!! Thank You Everyone!!! I'm so thankful to be part of this amazing blog hop! !